← Meritage, Clos du Soleil, Estate Reserve, Similkameen Valley VQA, BC, Canada, 2010, 14% abv. Although Jerry Lohr may have started out small in the 1970s, you could hardly say he stayed that way. Today, his Californian wine empire encompasses vineyards in three regions (Monterey, Paso Robles and Napa) growing grapes on 3,633 acres and pitches wine to masses of consumers at four different quality levels. The Estates tier is their entry level wine, and although it states Cabernet Sauvignon (77%) on the label, it’s a blend with Merlot, Petite Sirah, Petite Verdot, Syrah and 2% ‘other’ red varietals. On the eyes, the wine is deep ruby but with light legs. The nose is bramble berry with tobacco leaf, leather, sandal wood and baking spice. The palate is slightly off dry and shows medium acidity and light tannins with flavours of field berries, sweet rolled tobacco, cocoa, leather, and clove. WSET Good, basic and predictable with a 5 year drinking window (until 2018). 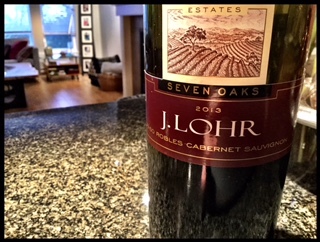 This entry was posted in cabernet sauvignon, Cabernet Sauvignon / Blends, California, Merlot, Petit Verdot, Petite Sirah, RED, Red, Shiraz / Syrah and tagged 13.5% abv, 2013, Cabernet Sauvignon, california, J.Lohr, Paso Robles, red wine, Seven Oaks, USA. Bookmark the permalink.